Fans of money, hold on to your hats. Apple has announced that its next quarterly financial conference call will be held on Tuesday, April 23, 2013 at 2 p.m. Pacific, 5 p.m. Eastern. In all likelihood, CEO Tim Cook will be joined by CFO Peter Oppenheimer, and the inscrutably terse company treasurer, Gary Wipfler, to discuss Apple’s performance in its second fiscal quarter of 2013. But there are a few reasons why this upcoming conference call might be more, shall we say, drama-filled than many of its fellows. For one, you might recall that in its last quarterly results, Apple changed up its process for issuing guidance about subsequent quarters, promising it would no longer provide numbers it was all but certain—short of the imminent apocalyptic collapse of society—to make. Instead, Oppenheimer gave a range of predictions, saying that the company expected to bring home revenue between $41 billion and $43 billion, with a gross margin between 37.5 and 38.5 percent, operating expenses between $3.8 billion and $3.9 billion, other income/(expense) of $350 million, and a tax rate of 26 percent. As of this writing, the analysts consensus seems to be that Apple will still rake in growth in its revenue for the current quarter: The average estimate is $42.77 billion, which is right in the sweet spot of the company’s guidance. Notably absent from Oppenheimer’s predictions was Apple’s traditional forecast of earnings per share; during the call, the CFO said that the given information could be used as the basis for a number of possibilities for EPS. But current consensus for that number seems to point in one direction: down. Analyst estimates put the company’s earnings per share in the range of $9 to $10, compared to the $12.30 in earnings per share that Apple brought home in the second quarter of 2012. That would mark the first time in recent memory that the company’s income has dropped year-over-year and, as with any change of this sort, expect the analysts to cry bloody murder. It’s also likely to provide a significant benchmark in terms of gauging Apple’s new forecast system. But, unlike the fluctuations in stock price, which are all too often based on the opaque perambulations of the market, a drop in net income could be significant, in that it may actually reflect something of Apple’s performance. If the company’s income does indeed shrink compared to last year, there are a number of reasons that might be at play, most of which aren’t as catastrophic as they might be made out to be. It’s possible, for example, that supply problems have constrained Apple’s ability to meet demand for its products—it simply can’t build them fast enough. That’s a sentiment we’ve heard repeatedly from Cook in recent earnings calls. Apple might also be selling more of its lower-profit items, such as the iPad 2, the iPad mini, and the older, cheaper iPhones. And while the Mac has largely outperformed the PC market over the last several years, that’s a segment that’s been seeing sharper and sharper declines with the advent of mobile devices like smartphones and tablets. Plus, it’s worth keeping in mind that the last quarter has seen very little in new products from the company. None of this is to spread doom and gloom, however. 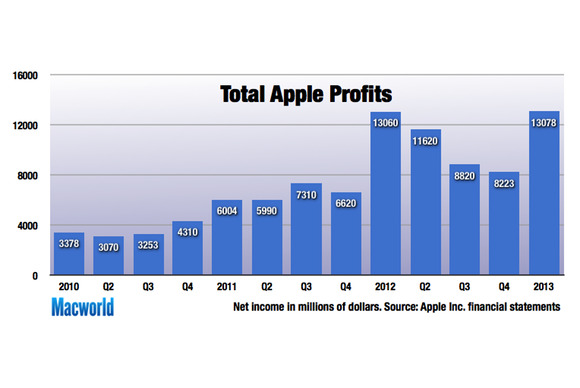 Let’s be crystal clear: Even if the company’s profit growth is down, Apple is still set to make a hefty profit. Just as one swallow does not make a summer, one dip in profit doesn’t mar a company’s fortunes forever.